Hi everyone. Jeffrey here. Happy Thanksgiving to our American readers. Happy New Year’s Eve to our syndicated readers. Happy Thursday to everyone else. Happy Birthday to Rex Parker who is now older than me. Check out the previous post for more on this milestone, including two related puzzles and a great cause that needs your support. 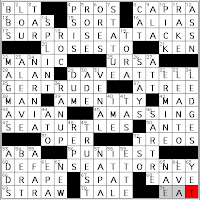 Despite holidays, birthdays and Thursdays, like the mail in Seinfeld, the crosswords never stop, so the blogging must go on! Amy is nowhere to be found so Team Orange is on duty to replace Her Fiendness. I must be Turkey Prime, as I get to go first. However, as a Canadian, I'm afraid there'll be no more mention of Thanksgiving. The theme is 51A: [What 20-, 31- and 40-Across were each introduced as by 47-Down] PARADE BALLOONS in the 47D- MACY’S Thanksgiving Day parade. Hey! Darn. 14A: [First step in a series] – A TO B. There is no Atob. 17A: [Rabanne who was the costume designer for “Barbarella”] – PACO. What a lucky break! Today at work, someone asked me who the costume designer for “Barbarella” was. What are the odds (that any part of that is true)? 25A: [Thoreau’s “On Fields OER Which the Reaper’s Hand Has Pass’d”]. Land of the free, we miss you. 36A: [Head of the Egyptian god Thoth] – IBIS. Every part of that sounds weird. 38A: [A slowpoke may be asked to pick it up] – PACE. Pick up PACE, PACO. Jane Fonda is waiting. Somewhere, a lonely “the” sits alone. 56A: [RAREE] show. Can you say RAREE without show? I’ll have my steakee raree, please. 1D: [Sound on “Batman”] – ZAP! Hard one. Could have been BAM!, POW! Or if this was a rebus, SPLAT! 2D: [Letter after Z] – ETA. Z is pronounced “zed” today. 11D: [Marie Osmond’s ADORA Belle dolls]. Awwww. Isn’t that cuutttte. 12D: [“CAROL of the Bells” (holiday favourite)]. Wouldn’t be Thanksgiving without it. 30D: [Frozen drink brand] – ICEE. Perfect with that steakee. 35D:[Loser of 1948] – DEWEY. Lost to Truman, right? More American stuff. "Prime Time Practice" by Ben Tausig. 28A: [*Find the source of some corporate malfeasance, say] -PIERCE THE VEIL. Dr. Hawkeye Pierce (Alan Alda) from M*A*S*H.
48A: [*Holy place] - HOUSE OF PRAYER . Dr. Gregory House (Hugh Laurie) from House. 62A: [*Mental material] - GREY MATTER - Dr. Meredith Grey (Ellen Pompeo) from Grey's Anatomy. 17A/21A: [Long-running PBS concert series] - AUSTIN CITY LIMITS . Colonel Steve Austin (Lee Majors) from The Six Million Dollar Man. Never knew he was a doctor. Well, it could be Dr. Kate Austin (Christine Lahti) on Chicago Hope. A quick check with other members of Team Orange shows similar confusion. 24A: [Text type] : SMS - Short Message Service, what you use for cellphone text messages. 34A: [Plitvice Lakes National Park country] - CROATIA. Banff - Canada. Yosemite - USA. Plitvice Lakes - Croatia. 39A: [Time off, in mil. 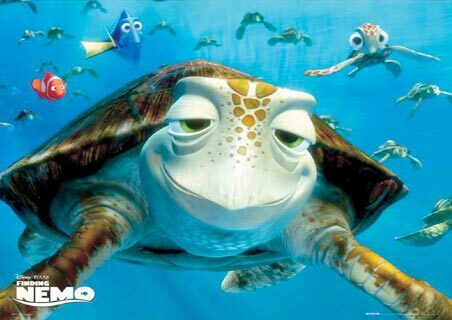 slang] - RNR - Rest "N" Relaxation. R&R is better. 59A: [Lamas of "The Bachelor"] - SHAYNE. No idea. Related to Lorenzo Lamas? Yup, daughter. 66A: [Quadratic function subj.] - CALC. Calculus. joon, please explain the difference between integral and differential calculus. 68A: [Publisher whose second and third children were born 35 years apart] - HEF. Hugh Hefner. 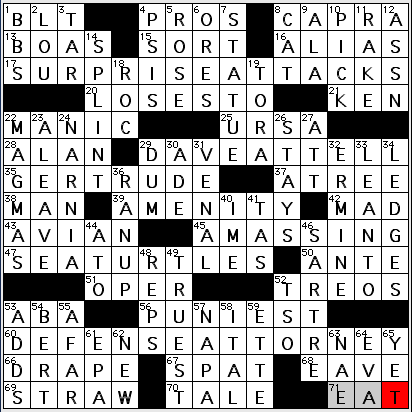 7D: [Common occasion for leaving work early: Abbr.] - FRI. Memo to my staff: I'll need a bit more than "It's Friday. I'm leaving early." 10D: [Starting a tic-tac-toe game at one of the edges, say] - BAD MOVE. Edge being a non-corner and non-center square. It could work in Hollywood Squares. You fool! (Steve Austin reference in this link). 24D: [Tattoo, in a way] - SCARIFY. New word to me. 30D: [Celtics guard Rajon] - RONDO. Of the Boston Celtics. 31D: [Jamiroquai's "(Don't) Give HATE A Chance"] - Lots of unknown-to-me in this puzzle. 46D: [Pen name for "The Conning Tower" columnist] - F.P.A. Franklin Pierce Adams. PIERCE again. I should know this? 57D: [Grammy-winning blues musician Robert] - CRAY. Here with Eric Clapton. The theme answers are all clued [Turkey] (the last with a “?”). Sigh. 27A: FRANK WAY TO TALK. 63A: FRIDAY’S SANDWICH. I think this is implying leftovers from Thursday feast. 52A: [Lake surrounding Canada’s southernmost point] – ERIE. Trivia question – How many US states are at least partly north of Middle Island, Ontario? Answer – 27! 1D: [“Mamma Mia!” band] – ABBA. 30D: [Greek New Age Keyboardist] – YANNI........oh, sorry, fell asleep for a minute. 32D: [Musical buzzer] – KAZOO. 54D: [Hendrix hairdo] – AFRO. I leave you with 51D: [Slovenly] – FROWZY. Frowzy? Frowzy? • 60A. DEFENSE ATTORNEY [Johnnie Cochran, at the Simpson trial]. And may our lives be free from any need for one of these... I liked seeing this fill directly below ABA [Legal org.] and was thankful to see that the correct fill was not POET LAUREATE-related. • STRAW/[Float accessory], so that would be this kind of float and not this kind of float... The latter, btw, was from the Rose Bowl Parade—not to be confused with ROSÉ [Wine choice]. You might enjoy that with your Thanksgiving dinner! Hope it's a happy holiday for all!